Home > Washington DC > The Weight of Sacrifice Memorial in Washington, D.C. The Weight of Sacrifice Memorial Washington, D.C. The United States got in and out of World War I in well under two years. 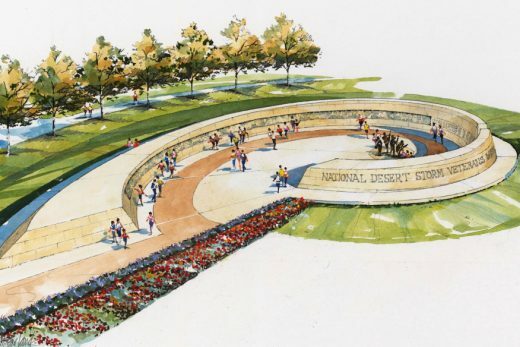 The U.S. World War I Centennial Commission hopes it can move as quickly, reports architecturalrecord.com. 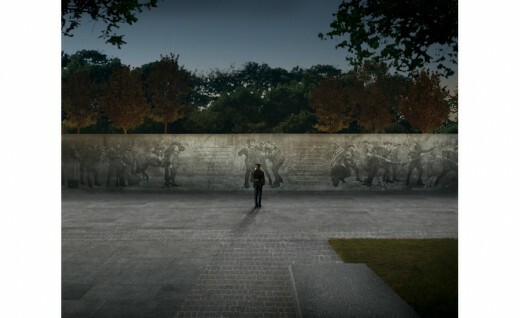 It has chosen a design for the National World War I Memorial by Joseph Weishaar, a 2013 graduate of the Fay Jones School of Architecture at the University of Arkansas. His proposal is titled “The Weight of Sacrifice”. There were 350 competition entries with 5 finalists were announced in August 2015. “People respond to places as much as buildings,” says Weishaar, 25. 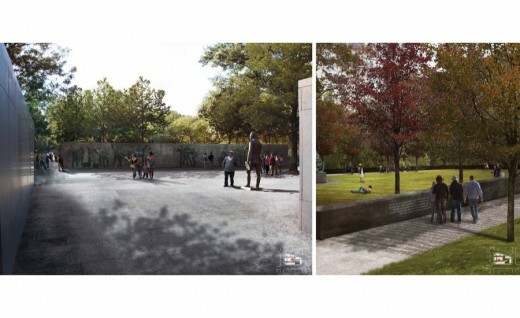 The main features of his memorial are a new lawn and two works by the New York-based neoclassical sculptor Sabin Howard. One, which Weishaar compares to the famous images of Iwo Jima, depicts three soldiers and a cannon. The other is an 81-foot-long bas relief. No one disputes that the park is run-down. 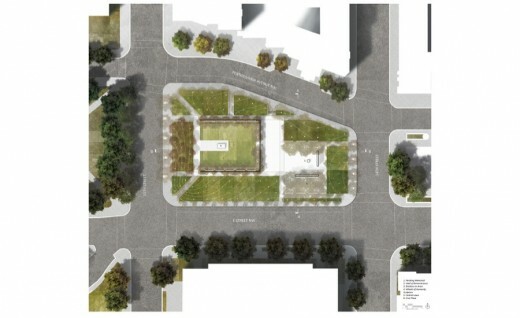 Its major feature—a sunken plaza that is meant to be a fountain in summer and an ice rink in winter—could never have been easy to maintain. But Birnbaum says it is maintainable and that neglect is no excuse for demolition. 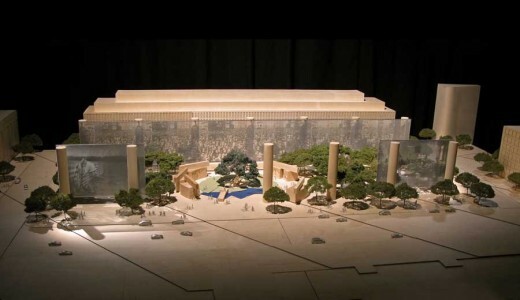 Weishaar’s design also preserves a statue of General John J. Pershing and two walls flanking it, though with small adjustments to create more of a dialogue between the statue and its setting. 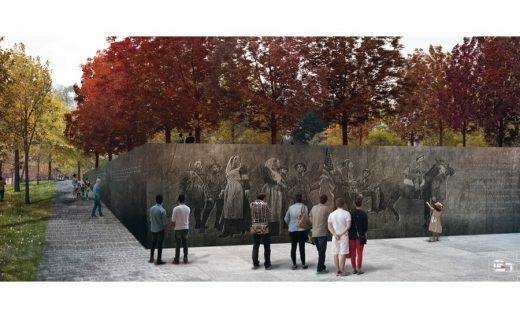 Weishaar, who works at the Chicago firm of Brininstool + Lynch and is in the process of becoming an architect (but designed the memorial on his own time), said he believes it’s important to depict the men who fought in World War I. He visited the websites of hundreds of sculptors looking for someone to depict soldiers realistically, and when he came to Howard’s, he said, he knew his search was done. He cold-called Howard the next day, and the artist (who grew up in New York but spent summers in Italy, where he was exposed to classical art) agreed to “drop everything” to work on the proposal. 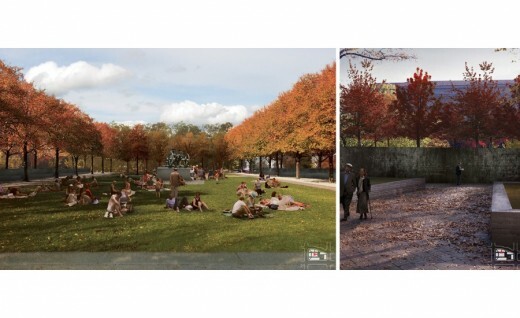 The team also includes GWWO, Inc./Architects, landscape architect Phoebe Lickwar, and engineering consultants Henry Adams LLC, Keast & Hood, and VBH. 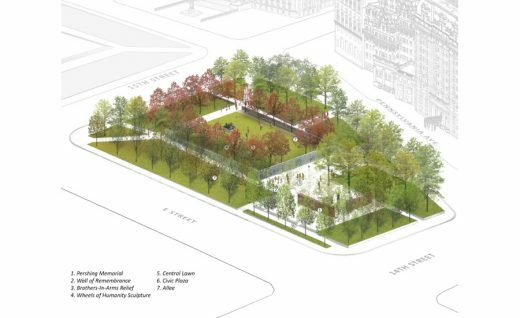 The commission hopes to begin construction in 2017 and to dedicate the memorial in 2018—the centennial of the end of World War I.
Website: ’The Weight of Sacrifice’ Memorial Design, Washington, D.C.